Handcrafted to ensure quality and made from 18-karat white gold, the Patek Philippe Calatrava Cross Cufflinks are distinctive jewelry pieces. In designing the cufflinks, the jewelry maker's artisans encircled each cross with round gold sections that include a raised design. The cross is the jewelry company's main insignia. It is particularly special because it is believed to provide protection and good fortune to the person who is wearing it. 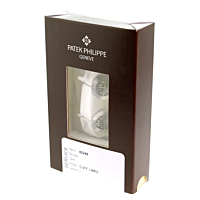 The Patek Philippe Calatrava Cross Cufflinks are made with style and longevity in mind.